New York Feng Shui Consultant, Laura Cerrano combines scientific research with the principles of Feng Shui to highlight the benefits of adopting the daily habit of removing your shoes before entering into your homes or apartment. Simple Feng Shui Changes Create Major Positive Transformations! With permission from my Los Angeles Feng Shui client, he said I could share his before and after photos. At a glance, there seems to be a lot going on. As we worked together, step-by-step we began to dissect the main cause for this physical arrangement of objects and furniture. So what happened after he agreed to at least test out the suggested Feng Shui changes and become more open and receptive? Let's find out! The three images you see above capture the Feng Shui changes implemented inside his apartment. Pretty much everything remained the same, with the releasing various smaller items he did not used. The biggest physical change came from letting the armoire go and investing in a different styled desk that sat lower and was lighter in wood stain. Did he spend a lot? No way. He found the new desk on craigslist for $40. In fact, he made money by selling the armoire and various other smaller appliances and items he no longer needed. This simple physical change created major positive transformations. It allowed the overall environment to 'breathe' and put him in a commanding position when writing. As a bonus, he also has a view of the outside vs staring inside the armoire. It's also important to note, the fact that he agreed to release the armoire demonstrated he was becoming more flexible and open to change. This is essential when a person is evolving and growing. What about that Scarface poster? 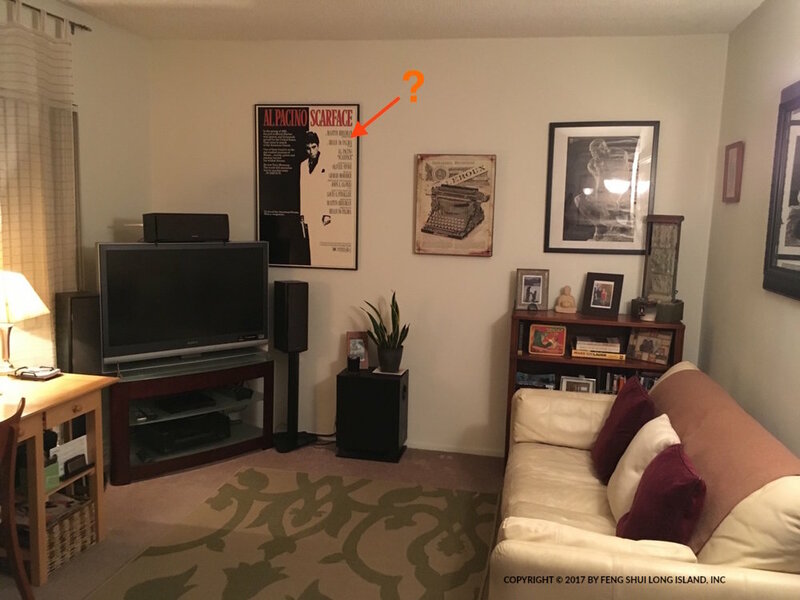 Yes, it's not the most ideal image to have in his home, though to a certain degree it does somewhat align with his career. The poster is a 'placeholder' for now until he finds something that is a better representation of his own work in the film industry. Now that we see the physical changes in his apartment, how does that translate into literal changes within his life? Keep in mind, as he was making all these changes to his home, he was simultaneously working on his 'Inner Feng Shui' by changing his mindset and attitude to be more present. The Torsional Fields are open and flowing!